There’s a cold wind outside as people start preparing for the holiday season. 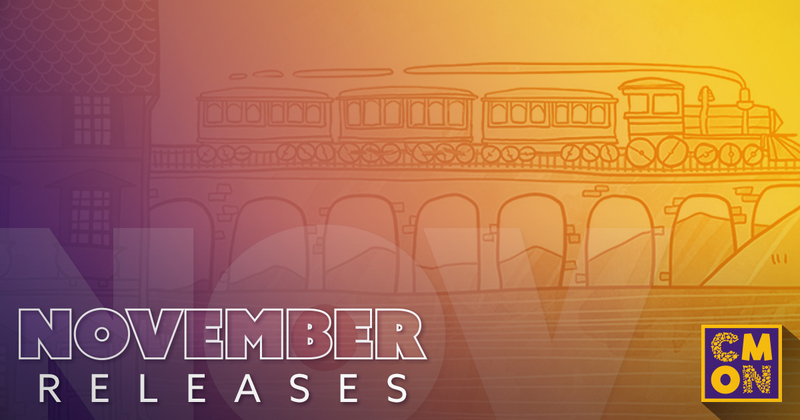 The end of the year brings all sorts of celebrations, and we’ve got a treasure trove of releases arriving at your FLGS today. Whether you’re hoping for a family game to get out when visiting relatives, or looking to bring a new faction to the miniatures gaming table, we have something for you. Let’s take a deeper look at them all. Staring things off is Railroad Ink. This is actually two releases in one, as the game has two different editions: Deep Blue and Blazing Red. In the Deep Blue edition, players can introduce the Lake and River dice to their game, adding some refreshing water to their maps as they try and build their transportation empire. Meanwhile, the Blazing Red edition turns up the heat with the Meteor and Volcano dice. Players have to repair the damage done by these destructive forces of nature if they want to score big. Each set can be used on its own, or combined with the other for epic 12-player games. If you’re instead looking for a dangerous game of cat and mouse, look no further than Narcos: The Board Game, based on the hit Netflix series. In the game, one player takes on the role of El Patrón, governing their Colombian drug empire with an iron fist and looking to gain the love and adoration of the people, while the others become leaders of the various Factions trying to bring him to justice. Desperation makes for strange partnerships, as the likes of the DEA, the Colombian Police, and several rival drug cartels all search for El Patrón. If they don’t act fast, the people of Colombia might just turn El Patrón into El Presidente. This month, we celebrate the 100th anniversary of the Armistice that ended WWI. On the 11th hour of the 11th day of the 11th month, all hostilities came to an end. To commemorate this momentous event in history, we are releasing The Grizzled: Armistice Edition. This deluxe edition includes both the base game as well as the At Your Orders expansion. There are also pre-painted plastic figures to represent the Grizzled soldiers out in No Man’s Land. Plus, the set contains a campaign that will take players through all the major events of The Great War. At the end, will the Grizzled still be whole, or will they be shattered and broken, just like the land around them? For our last board game, we take players back to the Renaissance period in Europe. Every day, scientific greats are making new discoveries and creating new inventions. In Newton, players are looking to add their names to the ranks of the greats like Brahe, Kepler, and Curie. By playing cards from their hand, they will move around the various boards, teaching their own students and traveling all over Europe to study at the great schools. In the end, one will be lauded as a scientific genius while the others will be left to the footnotes of history. Winter is coming not just here, but also in Westeros. But protecting the lands there from all the terrors that stalk north of The Wall are the Night’s Watch. These leftovers of society have sworn an oath to take no lands, bear no titles, and sire no children, and instead protect everyone to the south. The Night’s Watch is the first new faction for the A Song of Ice and Fire: Tabletop Miniatures Game, and they are starting off strong. To begin with, there’s the Faction Starter. More than just a couple figures thrown together into a box, the Faction Starter is a full army in one. Complete with the faction’s Tactics Deck, custom dice, tokens, full set of terrain tiles and the main rulebook for the game, it has everything a player needs to get started. And not just a couple figures, but enough to field a 35 point army and then some. Along with the starter set, two unit boxes are also available for the Night’s Watch. One is the Ranger Hunters. They are the cavalry unit for the faction. Fast and nimble, they are great harassers, going after enemy units with their bows and able to then cut them down in melee. Perfect for hit-and-run tactics, they are a great addition for lightning strikes. The other is the Sworn Brothers unit. They are the main backbone of the Night’s Watch forces. Good all-around and highly adaptable, they are the bulk of the Night’s Watch army. When a versatile unit is required, the Sworn Brothers are there. But the Starks and Lannisters aren’t being left out in the cold this month. Each one is getting their own unit, and they’re designed specifically to counter one-another. The Starks are getting the Stark Outrider cavalry unit. They are a nimble light cavalry unit, able to deal damage to enemies from almost any quarter. The Lannisters are countering with the Lannister Halberdier unit. The reach afforded by their weapons means they don’t lose Attack dice for losing the first rank of troops. They can also set for receiving a charge, giving them a free attack before the enemy can reach them. It’s quite a smorgasbord out there for you this month. A real feast for your gaming tables. All of these new titles can be found today in your FLGS. They’d make great gifts for the gamer on your list.